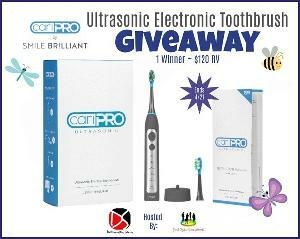 Prize: a cariPRO Ultrasonic Electronic Toothbrush. What you must do to enter: Enter your email and name on the giveaway form then agree to the rules. Then do as many social tasks that you can for more chances of winning! Open to U.S., 18+ years old. Void where prohibited.